What Is A Kettlebell? Blast Fat & Build Strength With Innovative Equipment! What if I told you that there was an exercise modality that was so efficient that you would reap faster gains in far less time? Here's what the kettlebell is and an effective workout to blast the fat and build strength! We all want to look our best and be fit... especially in the summer. Cute clothes, and less of them, make it almost a necessity to workout to feel great and confident. At the same time, the summertime can additionally bring so many things to do, and often, less time so there are not as many hours to spend in the gym. What if I told you there was an exercise modality that was so efficient that you would reap faster gains in far less time than more traditional methods? I would then tell you that you would no longer need to spend time doing separate strength and cardio sessions because it would be all encompassed in this one workout. Sound good? It gets better! Next I would tell you that you would improve your balance, power, coordination and flexibility while building amazing core strength, blasting fat and seeing beautiful muscle tone. Would you be interested? Well, this extreme fitness tool does exist. It is called a kettlebell! The Many Benefits Of Kettlebell Training. 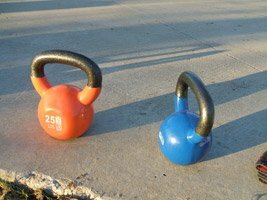 When I am recruiting people to try kettlebells, they often balk at first, telling me they are not into the latest fitness "gimmicks". However, kettlebells have actually been around for a long time. They originated in Russia and have been documented as far back as 1704. They are just not seen very much in mainstream gyms and training studios. This is a shame because what is often seen as a "gimmick" is actually an amazing and efficient training tool that will challenge the beginning exerciser as well as the seasoned bodybuilder. As anyone who is serious about their workout knows, variety is essential to truly challenge your body and keep making gains. I'm not sure why kettlebells aren't seen more, but I do believe they will be. So just what is a kettlebell? A kettlebell is a cast iron ball with a handle attached to the top of it (picture a cannonball with a handle on the top). This design makes kettlebells different from training with dumbbells because the weight of a kettlebell is not distributed evenly, thus creating the need to counter balance and stabilize during your workout (Aha ... core strength!). The most common weight of a kettlebell ranges between 9 pounds and 105 pounds. I start most women with an 18-pound bell, but some of my women in their 60's use a 13-pound for some exercises and 18 pounds for the rest. Most women I work with work up to a 26-pound bell. Yes, women of all ages LOVE the kettlebell! Not only is it a great workout, but the methods used with it make women feel empowered! The most common feedback I get from women while using the kettlebell is that it is a great workout, that it's so much fun, and that they feel strong and empowered! Exercising with kettlebells targets all of the major muscle groups as well as the stabilizing muscles delivering a full-body workout in an extremely efficient amount of time. Additionally, working out with a kettlebell guarantees to get your heart pumping which translates into aerobic and metabolic benefits. I've clocked anywhere between 500 and 900 calories burned during my kettlebell workouts. With rest breaks and the increase in heart rate, it's like getting a cardio interval workout while lifting and gaining strength. 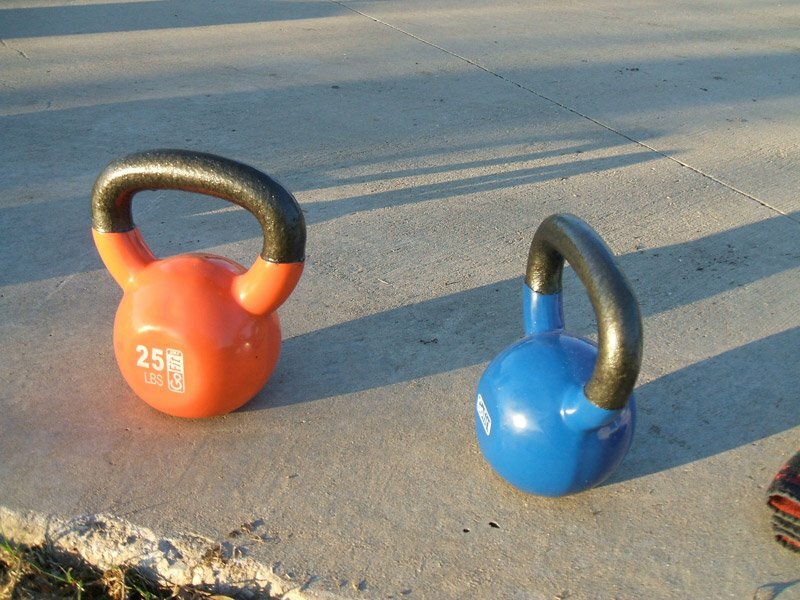 Kettlebells are great for men and women, overweight or skinny. If you are overweight, you will melt fat by burning tons of calories. If you are skinny, you will develop muscle mass. The kettlebell is an amazing tool for obtaining your ideal body composition no matter which way it needs to go. As a personal fitness trainer, I have yet to find any client who has not benefited from the kettlebell and seen rapid improvements. Has Not Benefited From Kettlebell Training. Compact in design, the kettlebell is a complete, portable gym. Imagine truly being able to hide your gym under the bed or behind a couch when not in use. Millions of people spend tons of money on gym equipment that ends up being a fancy clothes hanger. Not only will you actually USE your kettlebell, but you never have to worry about where to put it in your house. It's so small. It's portability means that you can take it anywhere and workout anytime. You can even get creative and paint your own design on it. Best of all, the power involved in using kettlebells makes them fun and addicting. I often use them with individuals as well as couples and groups and the response has been nothing short of phenomenal. While kettlebells are always great, the summer season has some great reasons to grab the bell. 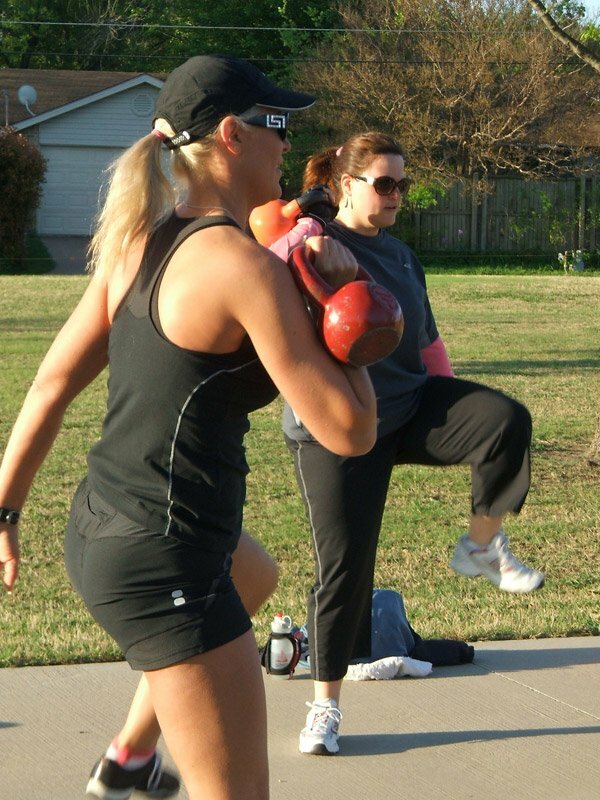 For example, I teach a class outside in the park using kettlebells. Don't feel like being cooped up inside or in the gym on a pretty day? Just grab your bell and take it outside. The park, the beach ... wherever. Makes Them Very Fun & Addicting. Since I am a woman, the trouble I have when introducing men to the kettlebell is that they think it is a tool just for women. Nothing can be further from the truth! While most websites will recommend men start with a 35-pound bell or higher, I have found that most men on the street actually need to start with a 26-pound or lighter! Granted, an experienced bodybuilder could easily start heavier, but my point is that you can't underestimate the power of the kettlebell. I do, however, really love this modality for my female clients. I find that women can push, press and swing much more weight than they ever imagined they would pick up off a weight rack in the gym. Therefore, some good slow presses create some fast, impressive gains in muscle tone while swings create endurance efficiency. For an added boost, I would recommend adding creatine to your daily supplements along with whey protein, of course. I also love Lipo 6 for helping with fat burning and energy. You will need a lot of energy when using the kettlebell! Click Here For A Printable Log Of Sample Kettlebell Workout. And there you have it! I know you'll want to kill me after that last one, but luckily I can probably run faster than you by the time you've finished this routine! The variations of routines you can do with kettlebells are endless! The above is just one example. Get creative and have fun with it! You'll have a blast and blast calories! So if you have been wanting to start an exercise program or are tired of spending so much of your precious time doing workouts, I challenge you to give kettlebells a try! Get in touch with a qualified instructor to teach you proper form and give expert guidance. I'm sure that you will find this workout with a bell quite a ball! 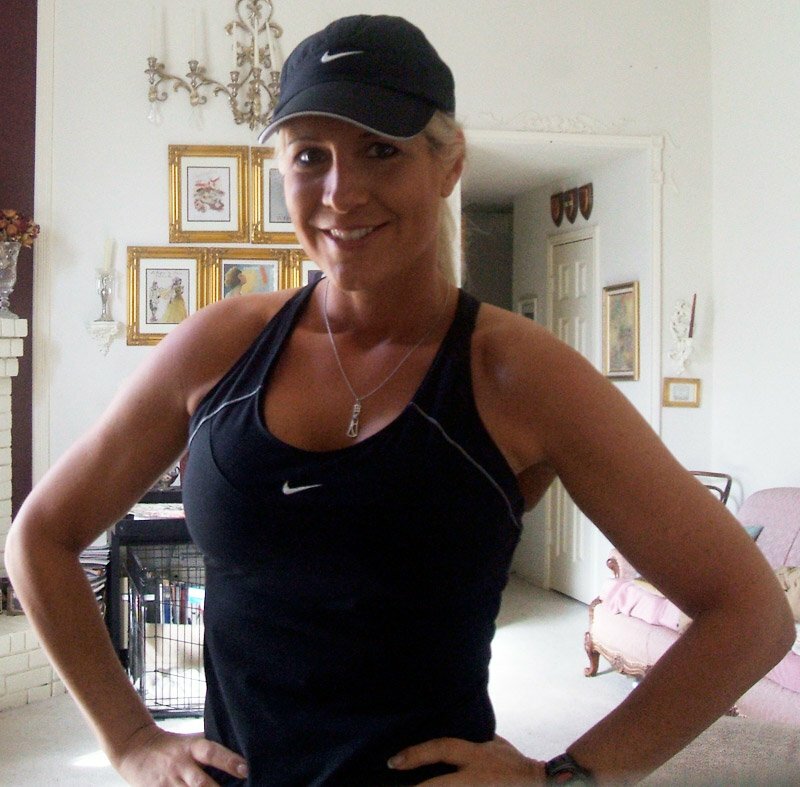 Author Contact: Pamela Micks is a Certified Personal Fitness Trainer specializing in Kettlebell classes and In-Home Personal Training in the Dallas, Texas Metroplex. She also offers Online Training for clients living outside of her traveling area. She is certified by ACSM, ACE, The Cooper Institute and The Scirion Institute of Exercise Physiology. She can be contacted at:pamela@realbodyfitness.com or 214-536-3304. At 37 years old and two children, it is my goal to inspire more women who are beyond their 20?s to be the healthiest they can!